Not so long ago I introduced the Session King – a range of instruments I designed with student and session players in mind, but two things have happened since I began making Session Kings. First, many of the folk who ordered Session Kings are not students and don’t play in sessions! They asked if they could have the same high performance instrument but a “high gloss” version. 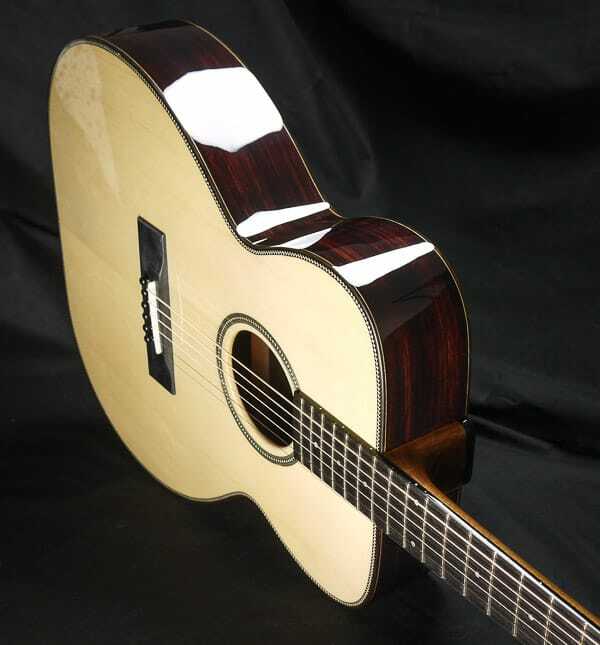 Also, session players tend to play with a pick, and many of my customers play fingerstyle guitar. Could I make one more geared towards their style of playing? 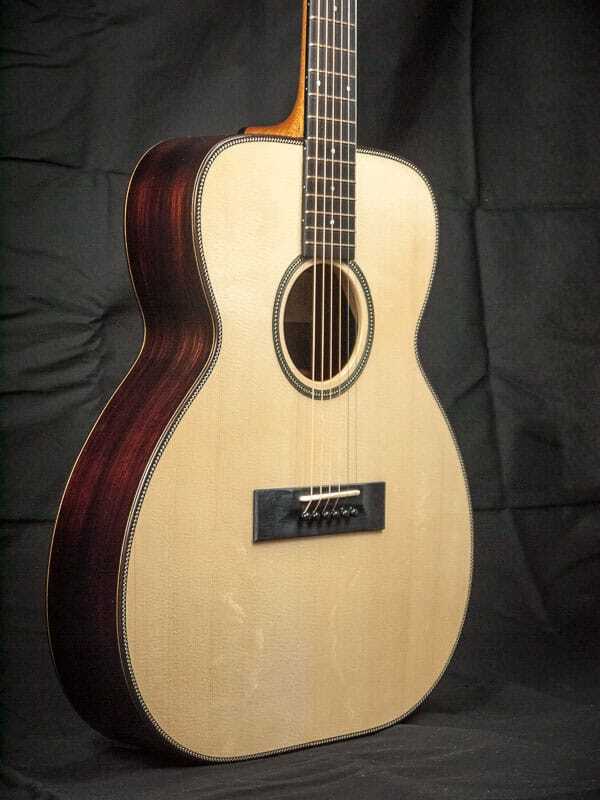 You can have an Model C-SKadv, or a Model S shaped one, or maybe you’d like a guitar based on the shape I use for the guitar bouzouki/tenor guitar? (Let’s call that shape the Model G) So that would be a G-SKadv. To make more suitable for fingerstyle I’ve built a very slight spherical arch into the top (regular Session Kings have a totally flat top.) Now a lot of makers either ignore or just don’t understand the importance of the huge effect doming has on a guitars voice, but for me this is the primary “lever” to be pulled when coming up with a design. By doming the top, what goes on underneath can be lightened to make the instrument super responsive. 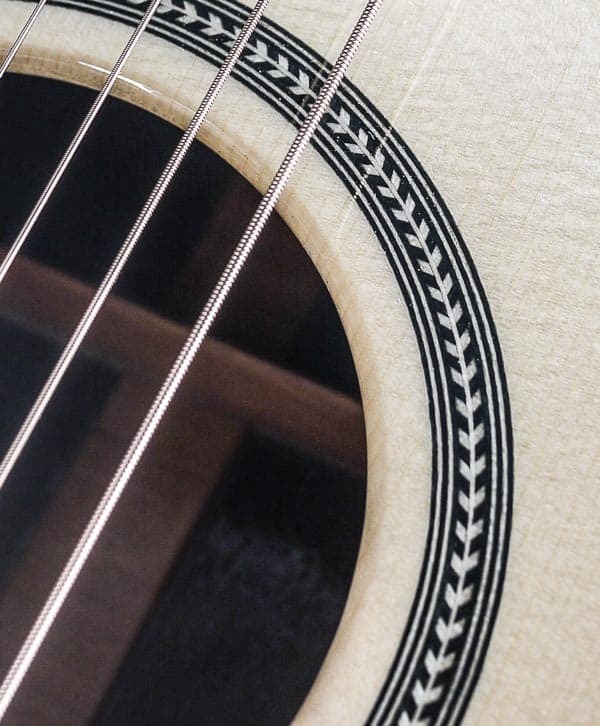 And different archings and domings all have a different “voice.” You can shape the sound an instrument makes far more effectively in this way than tinkering around with bracing patterns and woods. I know, I’ve tried! Price wise, this model will help bridge the gap between my cheaper Session King range and my more expensive SS and HO models. 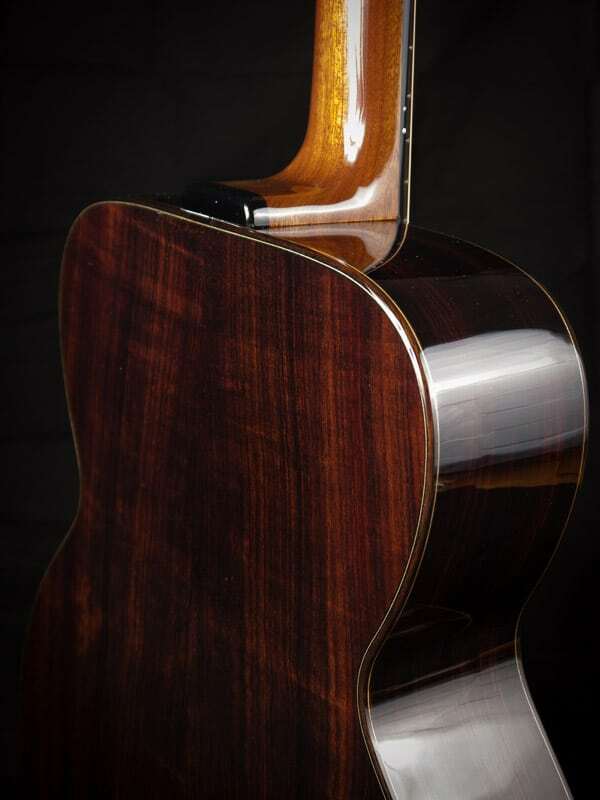 The back, sides and neck are khaya mahogany, (the guitar featured has upgraded back and sides – Indian rosewood in this case) and the fretboard is Sri Lankan ebony. The soundboard is spruce or cedar. 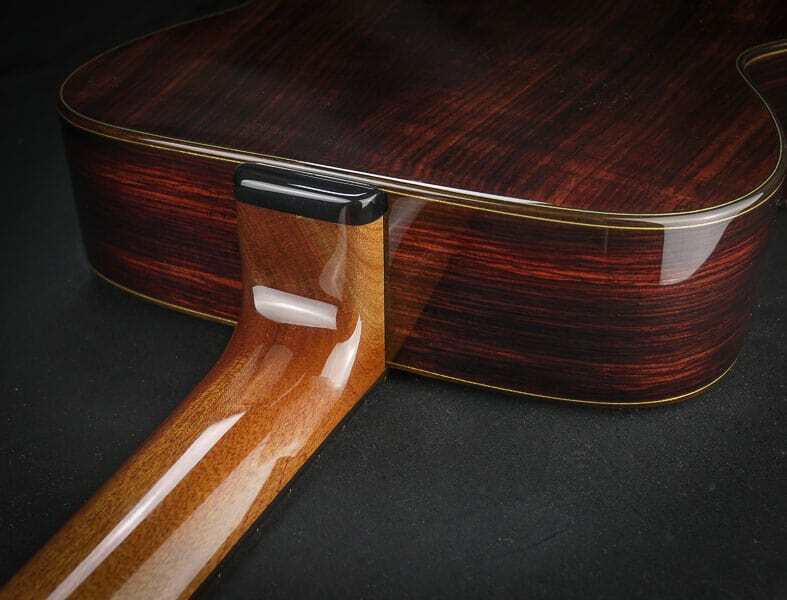 The bridge will be either ebonised fruitwood or Rocklite. The binding is wood, the back and side purfling is made from dyed maple lines. 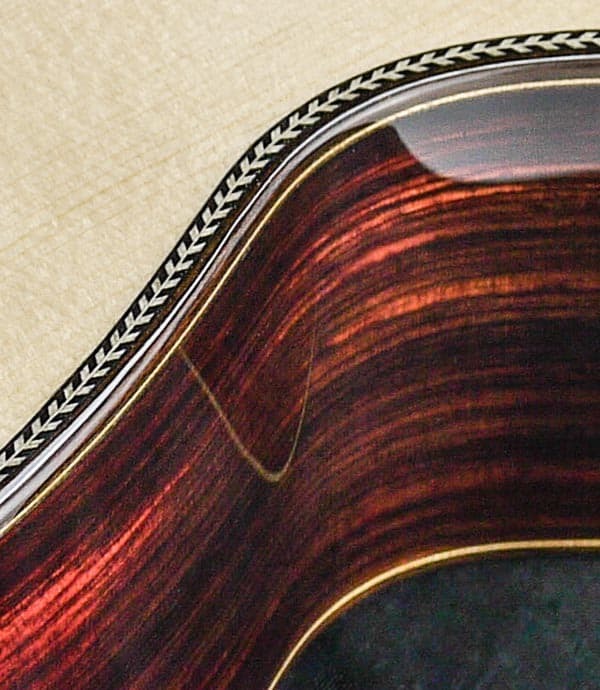 The top purfling and rosette is traditional herringbone. That look really reminds me of the guitars I made as an apprentice for Sobell back in the 80’s. Classic. The finish is a high gloss modern lacquer. Tuners will be Hipshot or whatever you like best. The sides are laminated for stiffness and mass. 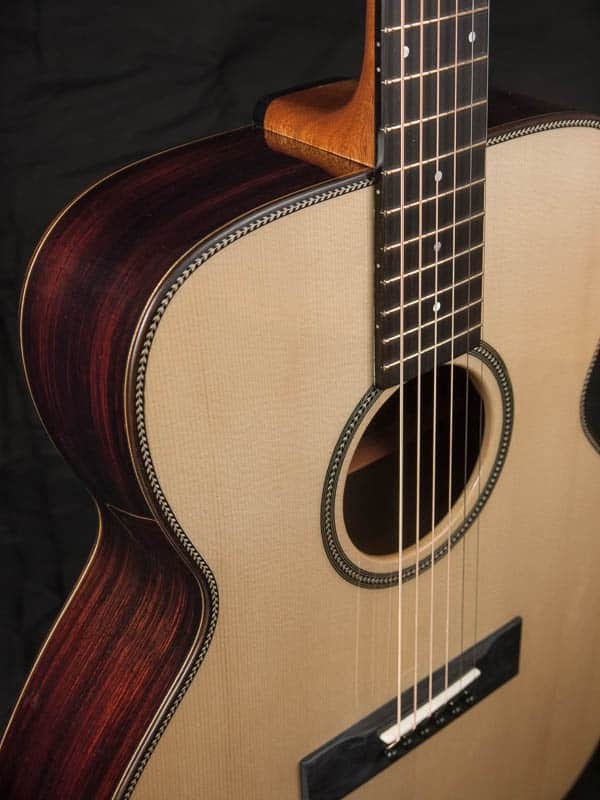 It’s a fine balance between making a guitar that has a super light soundboard and a body massive enough to make the top work that bit harder that it would otherwise and making an instrument that is both robust and not so heavy as to clash with preconceptions as to how guitars should be. So whilst these guitars are heavier than most, they are a fair bit lighter than the first generation Session Kings. But just as loud. So there you have it. If you’d like to know more, just drop me a line.